One of my favorite characters in A Civil War Christmas is the small role of Mary Surratt. She only appears in one scene in our play, but she was a major player in the real-life theatre of the American Civil War. 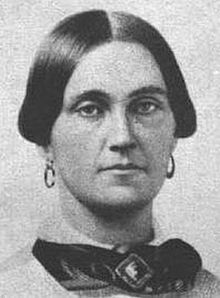 Mary Surratt owned the boarding house where John Wilkes Booth and his buddies (one of whom was Surratt’s son John) were known to have plotted to assassinate Abraham Lincoln. An ardent confederate sympathizer, her role in the conspiracy is still debated today. This controversy is amplified with tragedy, as she was found guilty of conspiracy in a trial that many considered hasty and extremely biased, and then later became the first woman executed by the United States government. She was hanged alongside three others found guilty of conspiracy, including Lewis Payne, who also appears in our play. Her son, John Surratt Jr., was out of the country during this time, and upon his return was tried and acquitted of the same charge. Played in our production by the lovely Lynn Hauer, Mary Surratt is depicted as a passionate and loving mother. We are not alone in this interpretation– in Robert Redford’s 2011 film The Conspirator, Surratt puts her life on the line when she conceals her son’s wrongdoings and whereabouts during her trial. Playwright Paula Vogel draws a clear comparison between our two southern belles– Mary Surratt and Mary Todd Lincoln, pointing out that both women grieve deeply the losses in their hometowns. In our own moment in American history, many mothers are also grieving. We too have lost many to the horrors of war, and too many mothers and wives have been handed sorrow in the form of a folded up flag. As we remember our veterans tomorrow for Veteran’s Day, remember also these women. Mothers and wives, and all the loved ones of those who paid the ultimate price for our freedom. They also serve and our freedom is carried in their grief. A Civil War Christmas by Paula Vogel runs Dec 14, 15, & 16 at First Baptist Church of Downey at 7pm. 8348 E. Third St., Downey, Ca 90240. Tickets are free. Visit www.fbcdowney.org or call (562) 923-1261.